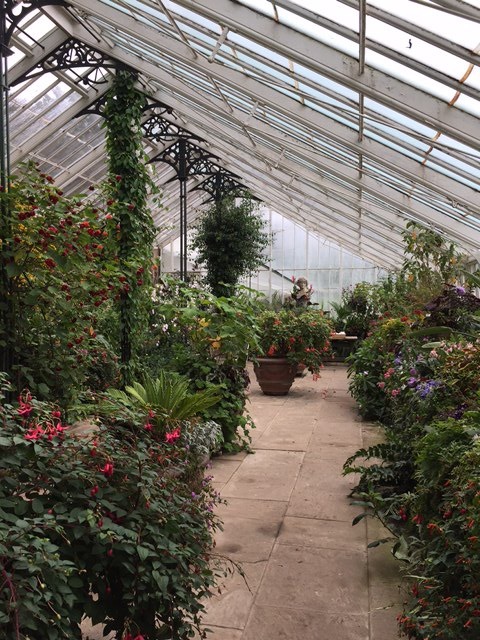 Two designers from Coolgardens, Charlotte and Holly, headed to the north this weekend to visit some of Britain’s best known gardens and least known horticultural gems. 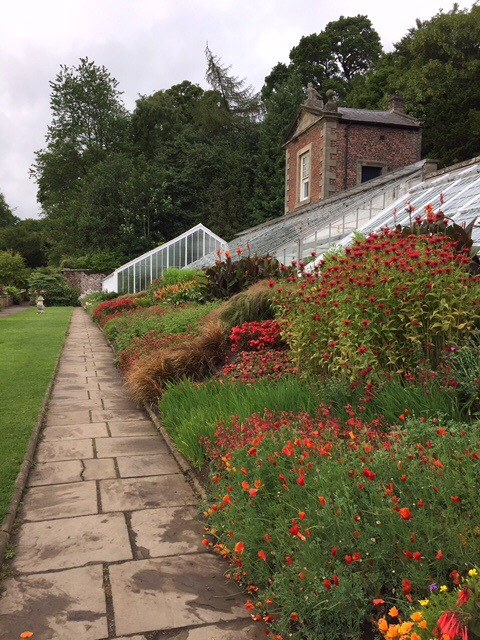 We will come to Alnwick later- here is a sneak preview…..
We didn’t really think about it until we were in the car, but 5 and a half hours up to Northumberland was quite a commitment for less than two days visit, particularly when we only specifically wanted to visit one garden! 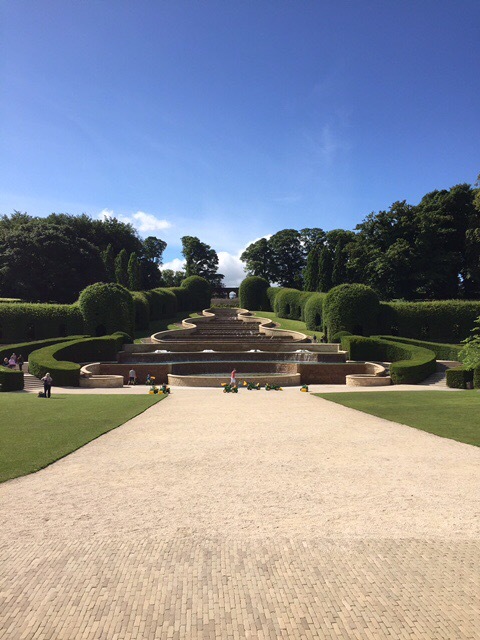 This was of course Alnwick, one of Britain’s newest and most ambitious gardens since the Second World War. Having headed out however, we were going to make the most of it and set about looking for where else would be good to visit. We did, after all, have nearly 6 hours in the car to research! Saturday morning arrived dismal and pouring with rain. 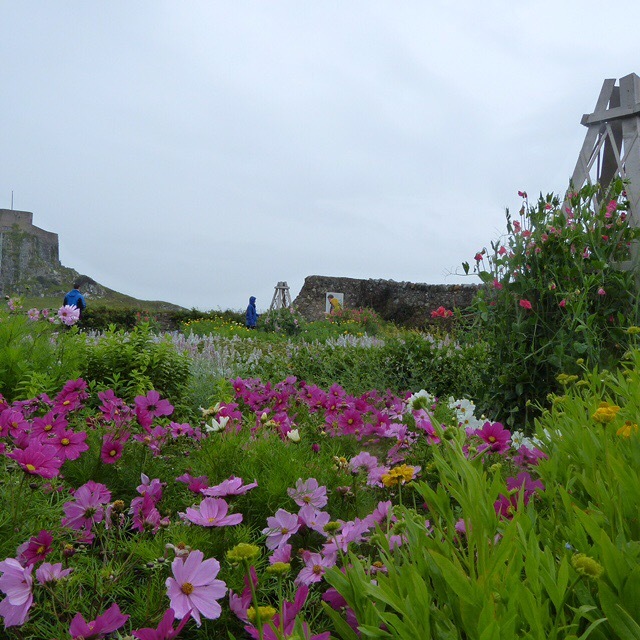 Having been promised sun for the following day, we postponed Alnwick for sunshine and headed to The Holy Island of Lindisfarne, admittedly mainly because last year’s trip to Cornwall involved a boat trip to a garden and we wanted to do it again. A causeway was our nearest comparison and it was very exciting! We slipped over before the timetable advised (fine, apart from a few puddles – but please don’t take our word for it if you visit!) and were in the village as it opened. 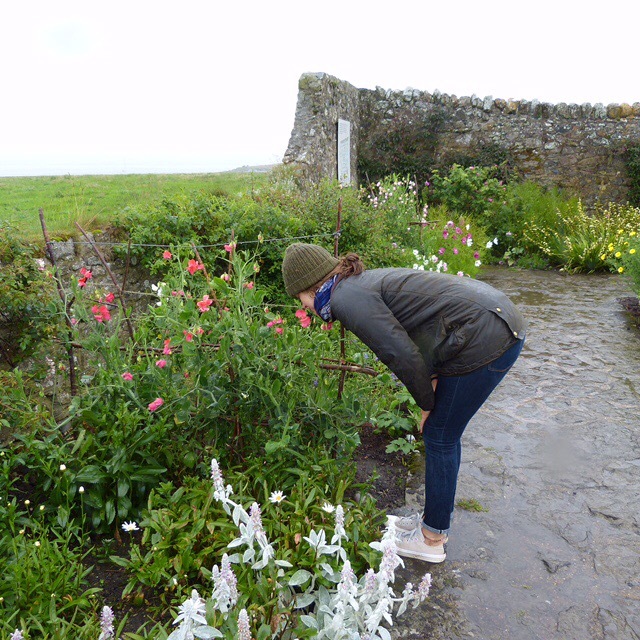 Extremely underdressed for the weather we headed out to the castle (closed) and the Gertrude Jekyll walled garden. After rummaging around through wet fields for 20 minutes we finally realised it was a walled off section of grassland about a quarter of a mile from the castle. This was to set a precedent for the layout of northern castles and country houses I’m yet to get to the bottom of. If you know why, please do tell me! 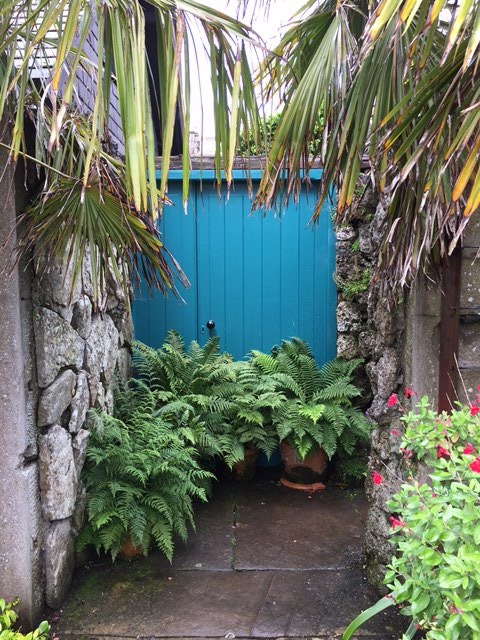 The garden was a quaint and flourishing stone courtyard full of riotous colour and beautiful perennials. 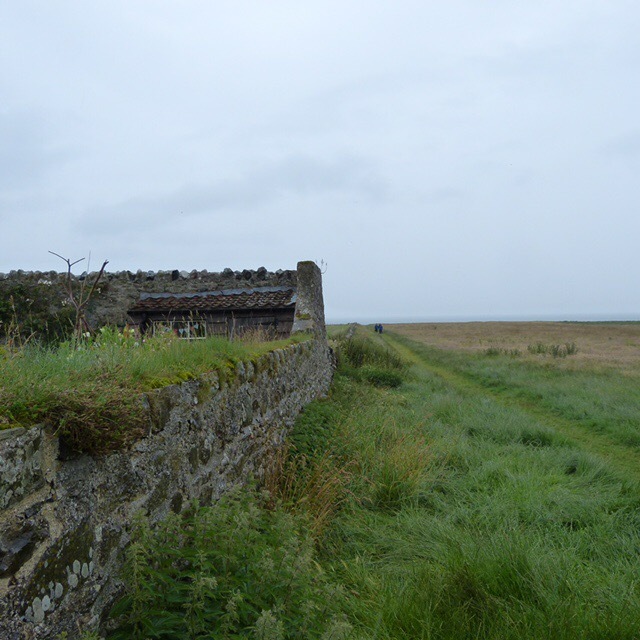 It was lovely but slightly odd in the middle of the bleakness of the Lindisfarne coast! The sweetpea were in flower, the Calendula were an orange mass towards the back and the Stachys were on a mission to overtake the whole space. It was a real pleasure despite the pouring rain and the juxtaposition in its environment made it all the more delightful. 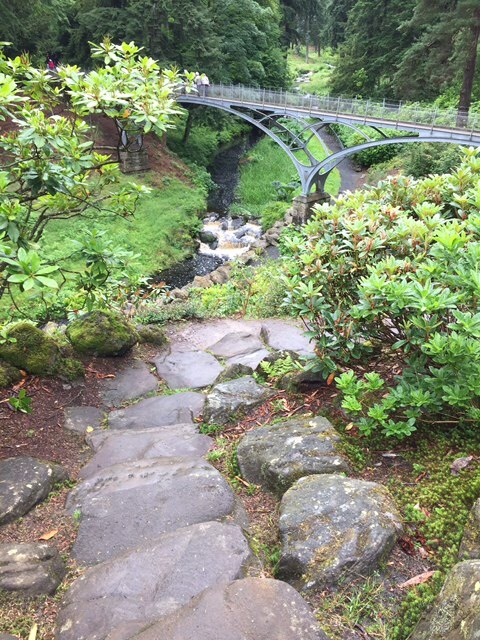 After a stop for some excellent coffee at ‘The Pilgrim Coffee House’ and a mooch about Lindisfarne, Charlotte and I headed back over the, by now very safe, causeway and headed for a much too brief stop at Cragside and ‘the largest rockery in the Britain’. 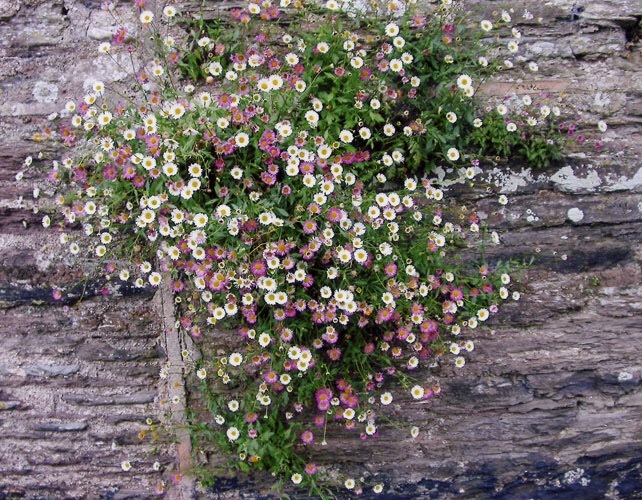 We’d initially dismissed this, since the Victorians are quite famous for their rockeries and these can sometimes be quite distasteful, however this was something else entirely! The steep sides of the valley on which the house is perched have been broken up with enormous boulders that have created meandering paths and streams. These lead from the house down to an enormous iron bridge that crosses the river at the bottom. A huge bank of Rhododendron on the steep slope in front of the house must make the view back to the house absolutely astonishing in the spring. 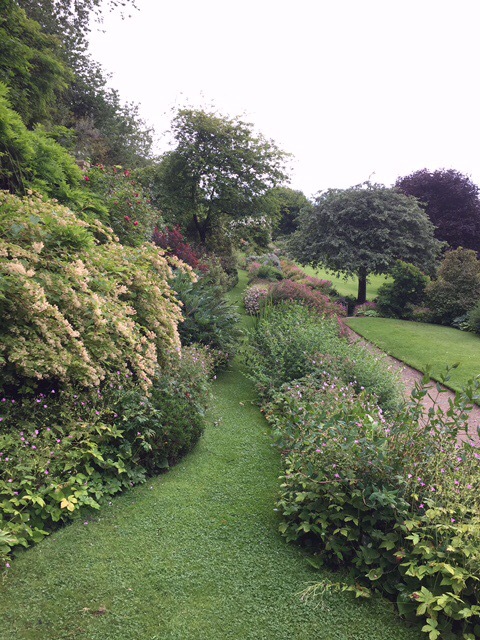 The walled garden was about a 10-15 minute walk from the house (spot the start of a theme!) and was another delight. 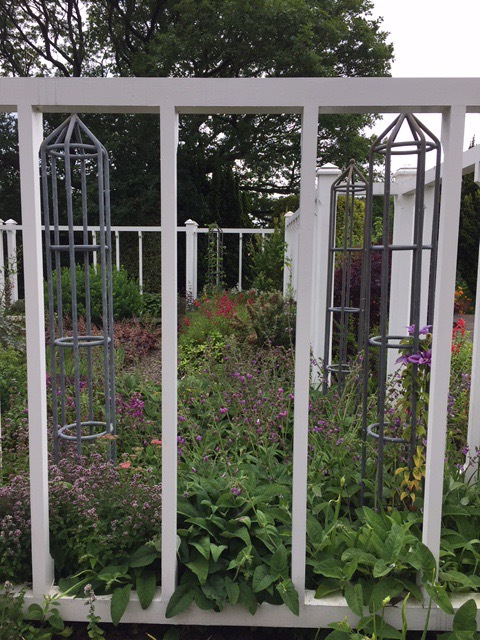 The main structure of the garden was formed through a white pergola-like framework which enclosed the garden without shutting any of it off. We weren’t sure about it at first, but the more we wandered around, the more we liked the structure it provided. 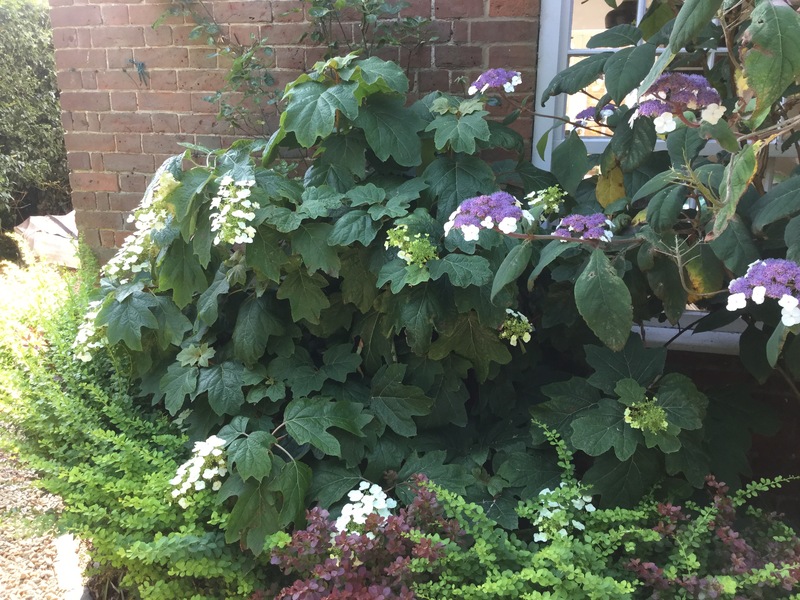 The beds were mainly herbaceous and although some evergreen shrubs provided some grounding, the white pergola really provided a good backbone for it all. 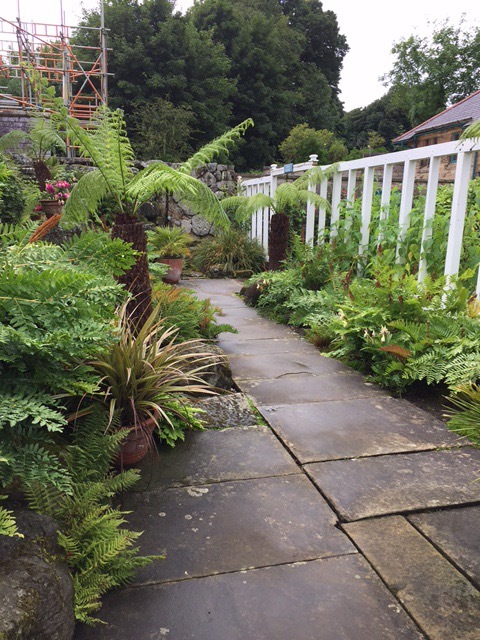 A lovely surprise was the fernery, tucked away through a gate and leading around to a formal lily pond and then a sunken grotto, open to the air but nonetheless well planted and intricate. A complete delight. The walk between the walled garden and the rockery is a Pinetum, a very Victorian concept and one I’m usually sniffy about, but this was again a really excellent example – some fabulous ancient pine specimens were architecturally magnificent and little details such as the Snake Bark Maple grove were inspiring! Onwards and we squeezed into a tiny little two acre garden called Bide-a-Wee Cottage an hour before it closed. 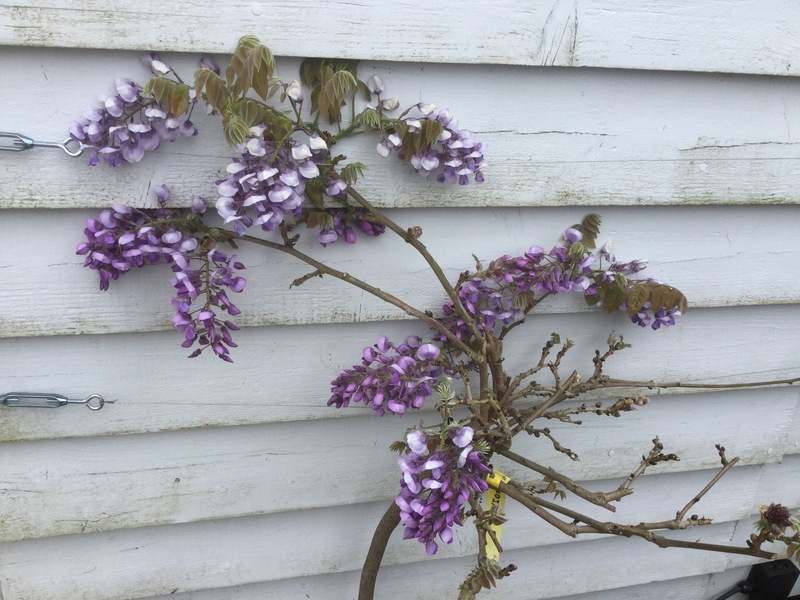 This had attracted my attention through some lovely cottage garden photographs and the fact that it advertised the on site nursery as containing ‘unusual’ perennials, which is like cat nip for the keen gardener! This is an absolute must if you visit the area! 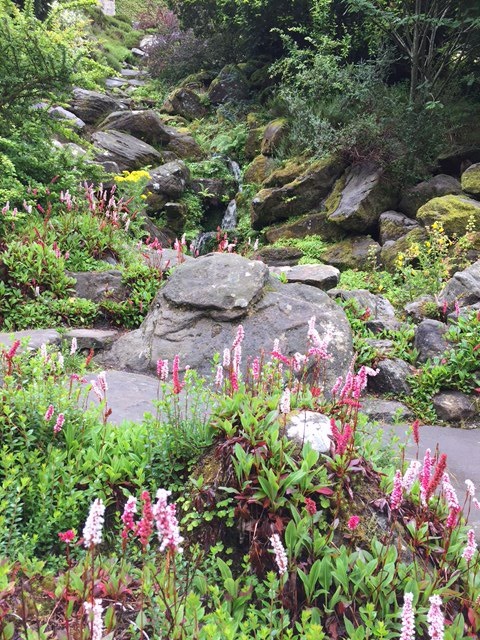 I cannot convey quite how much I loved this garden. 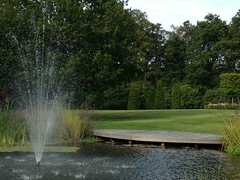 It’s an English garden par excellence. 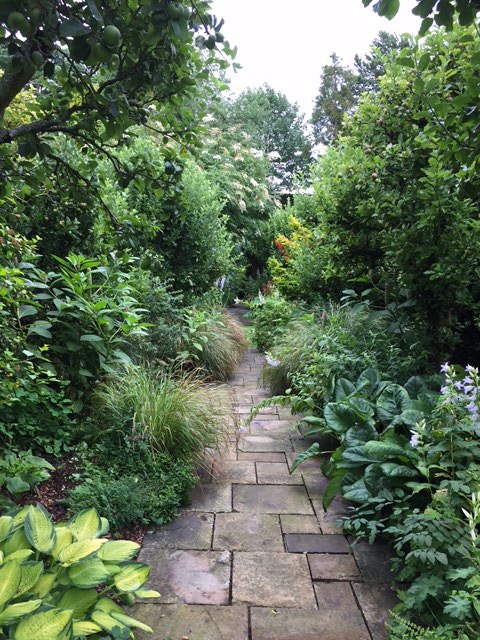 Overflowing planting beds reveal tiny narrow paths that lead through and around this garden without revealing your final destination until the last minute. There is the sound of water but you can’t quite see where it’s coming from and then you suddenly stumble across a little rill running alongside the path and then disappearing under the slabs leaving you guessing where it might appear next! 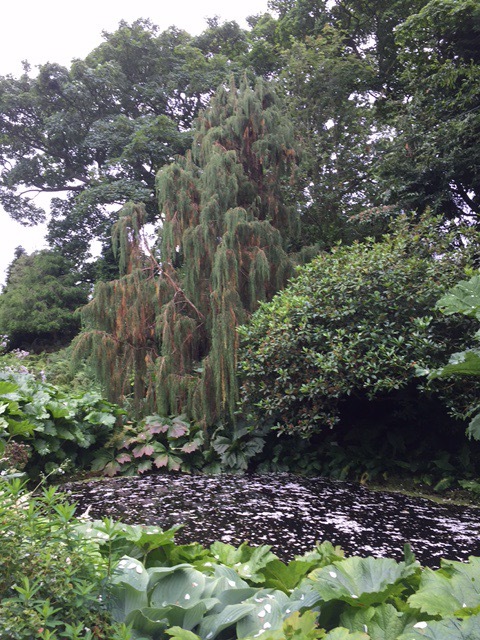 The bottom most section of the garden is dominated by a lovely pond surrounded by masses of ferns and a lovely weeping Taxodium. 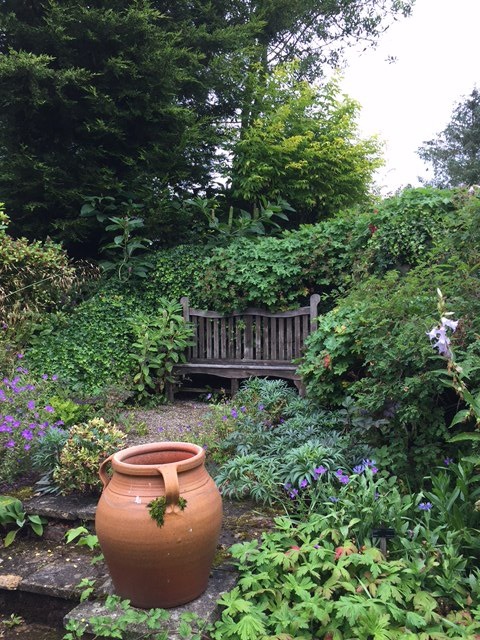 Viewable from nowhere else in the garden but accessible from everywhere this is a tranquil and sweet spot. 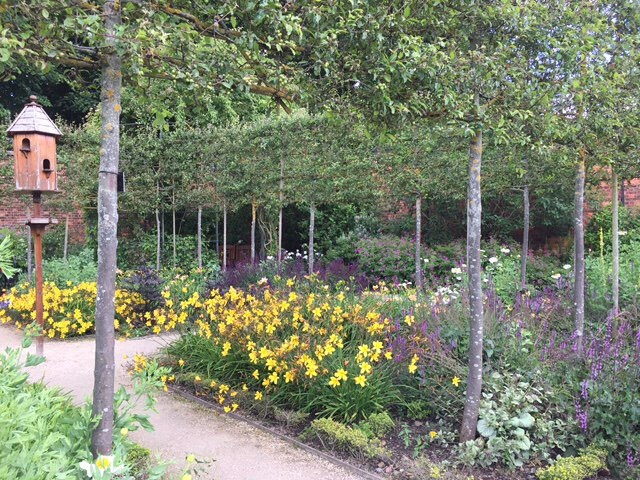 Working our way through the various paths up to the house, the beds ares full of lovely perennials we either don’t know and want, or recognise and want. Either way, I wanted this garden! The car was considerably fuller when we left! 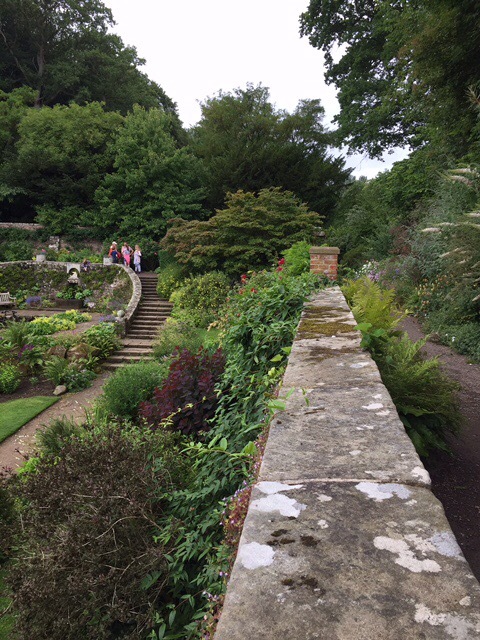 The parapet gives views over the garden, as well as providing a home to a beautifully kept herbaceous and annual bed and a FABULOUS glasshouse. 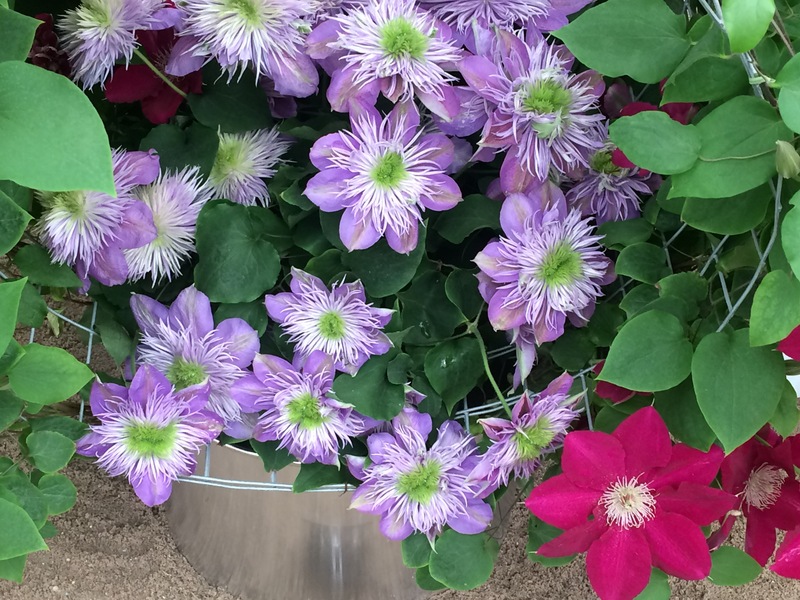 This is just chocka with tender plants, scented climbers running up the pillars and regular garden plants all squished in together. I’ve never thought to use pelargoniums as climbers but it works! 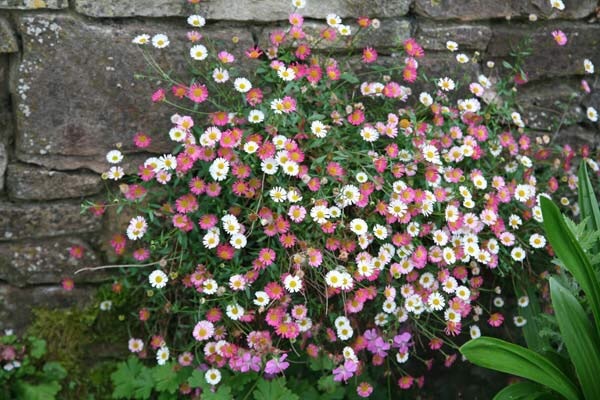 The garden is a mixture of lawns, lush planting beds and the sort of brick walls that make garden designers swoon. The garden ‘rooms’ were lovely with really nice glimpses through to the next but holding back enough to make us go and explore like 10 year olds! Now. To the meat of the matter. The following day provided the promised sunshine and we headed over to Alnwick in considerable excitement. 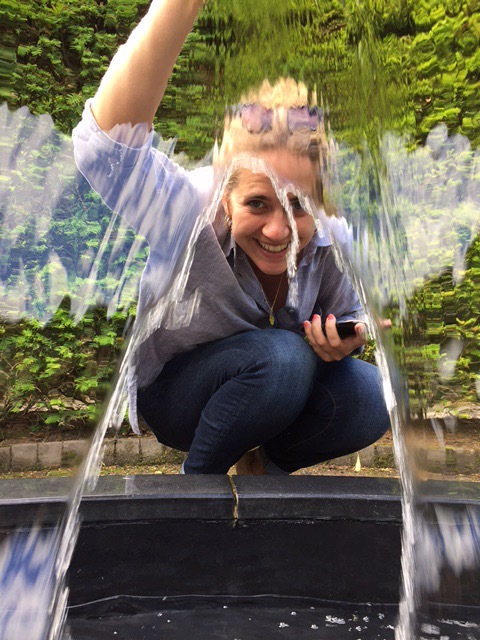 I’ve had a picture of the famed cascade on my desk wall now for several years and we were excessively hyperactive in anticipation of the real thing (would you want to employ garden designers who didn’t get overexcited at these things??!). The cascade is indeed magnificent; huge and very impressive. 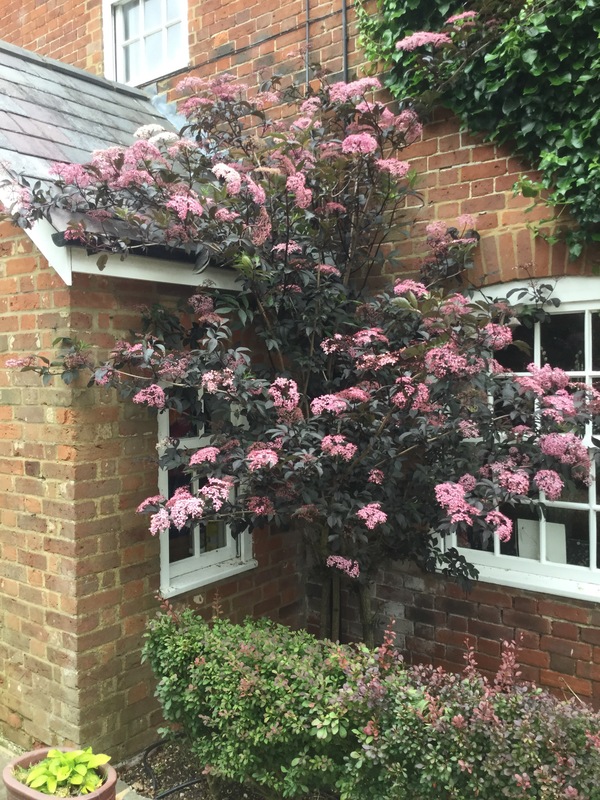 It completely dominates the garden and is a perfect example of why going big in a smaller space can work. 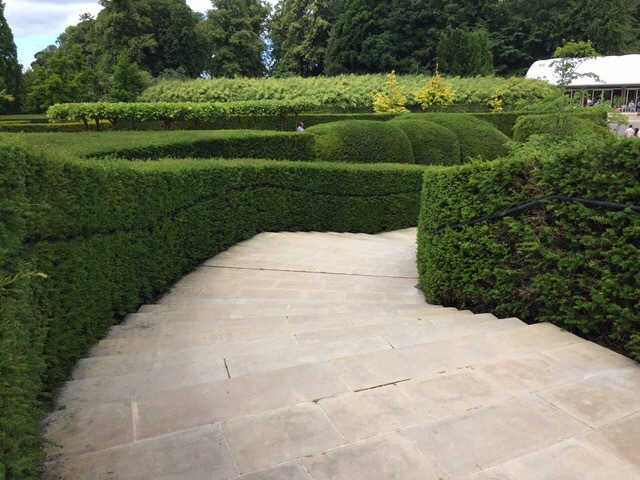 It could be argued that the garden is not big enough to justify such enormity but it felt to me like it created a sense of space and grandeur that was not diminished by the surrounding garden. 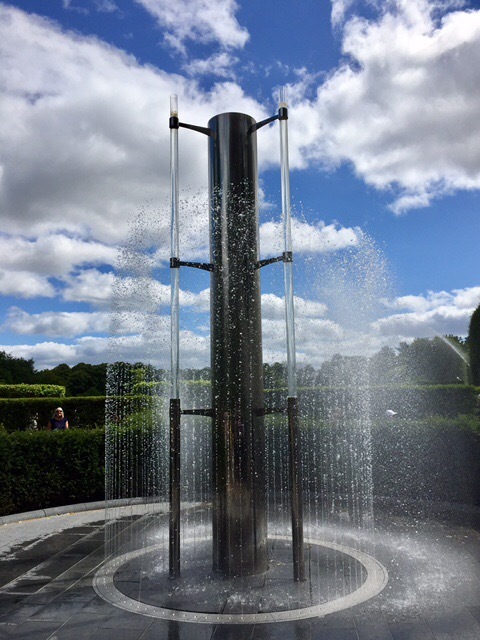 Having been told it was smaller than the cascade implied, I thought we would get round it in an hour and a half, however Charlotte and I were still being delighted by new things four hours later. 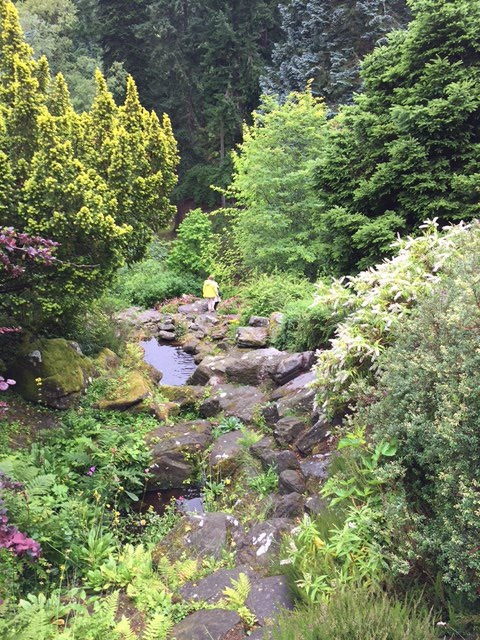 One of the highlights of our visit was the tour of the Poison Garden by an incredibly knowledgeable guide, we would definitely recommend this! 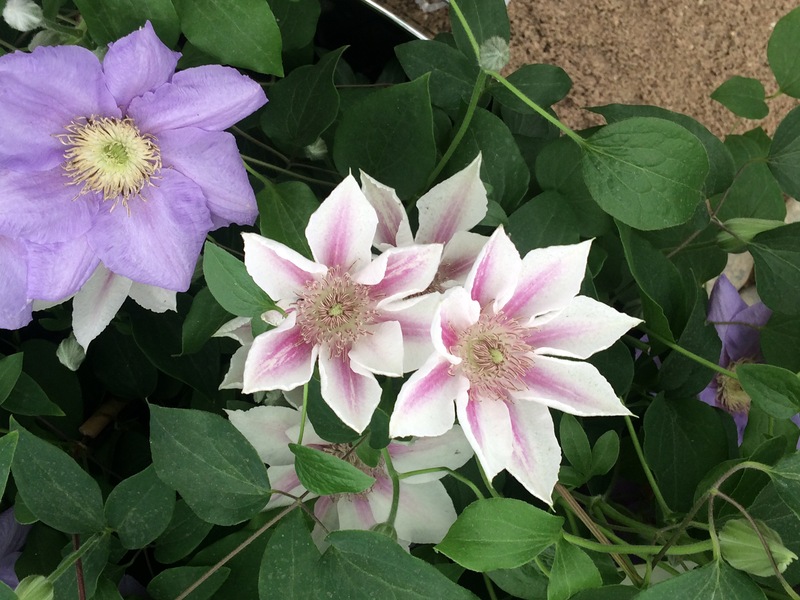 Who knew Alexander the Great was killed by an overdose of hellebore given to him to treat worms?! We certainly didn’t! 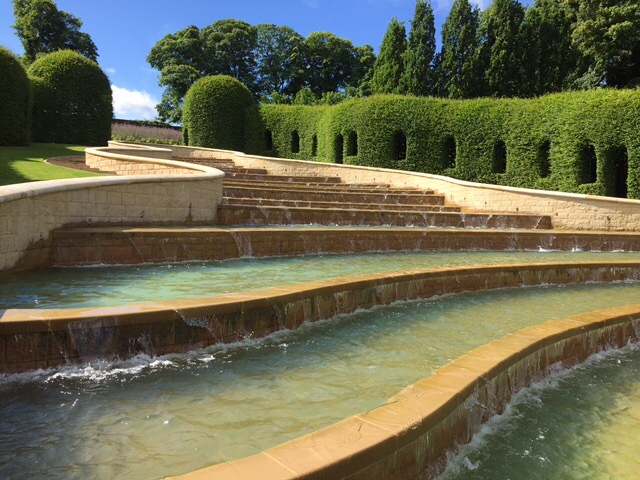 The bamboo labyrinth was excellent, we thoroughly enjoyed working our way round the sciencey water features and we were both thrilled with the novel ideas in the walled garden – pleached Malus trees and Malus hedging worked really well. 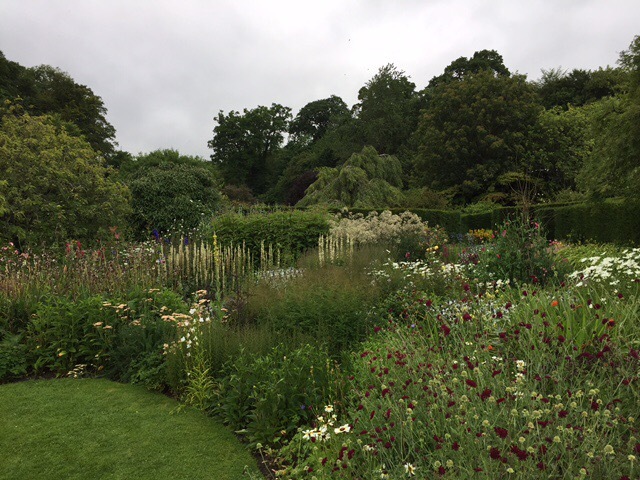 This garden really is a garden designer’s dream, in the sense that it is very much about structure, layout and use of space, however, the ornamental and rose garden provide more than enough to keep the plants men and women extremely busy and engaged. We can’t wait to have a chance to visit again. 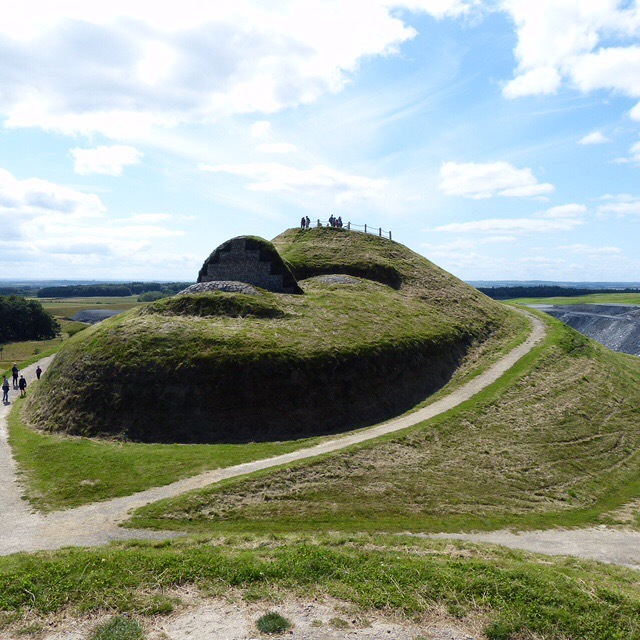 Finally, to squish in as much as we could, passing down the A1 we stopped at Northumberlandia. 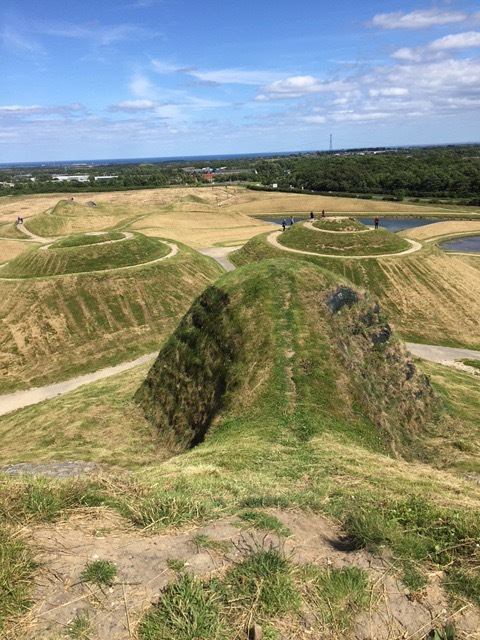 An amazing landform site designed by Charles Jencks that we only heard about because a couple staying in the same pub told us about their day. A huge scale woman made from the excess from a nearby surface mine and built by enthusiastic miners, this is a PR stunt on a grand scale for how mining can be a boon as well as an eyesore. 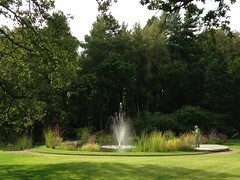 Essentially it is a large nature reserve, but done beautifully and free to get into. A work of genius most definitely and well worth a visit. 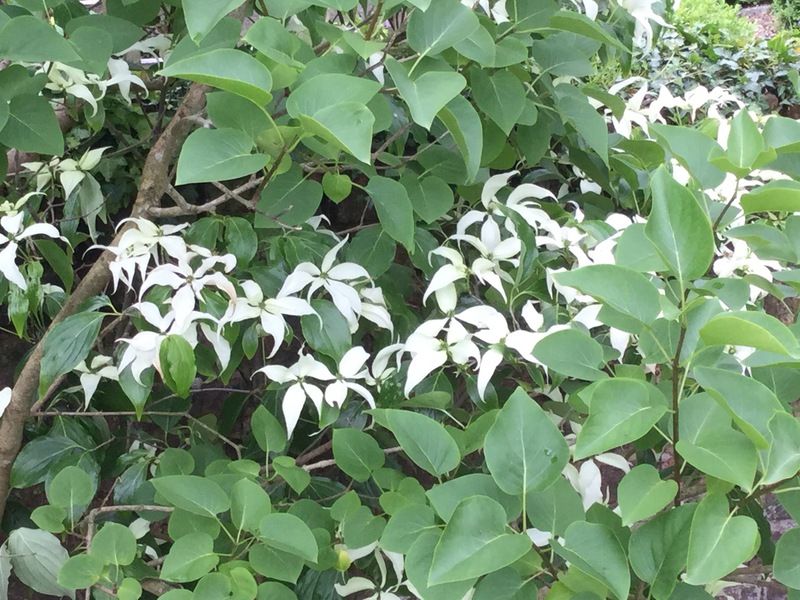 This falls into the important group of “large bulky shrubs” that many gardens are short of. 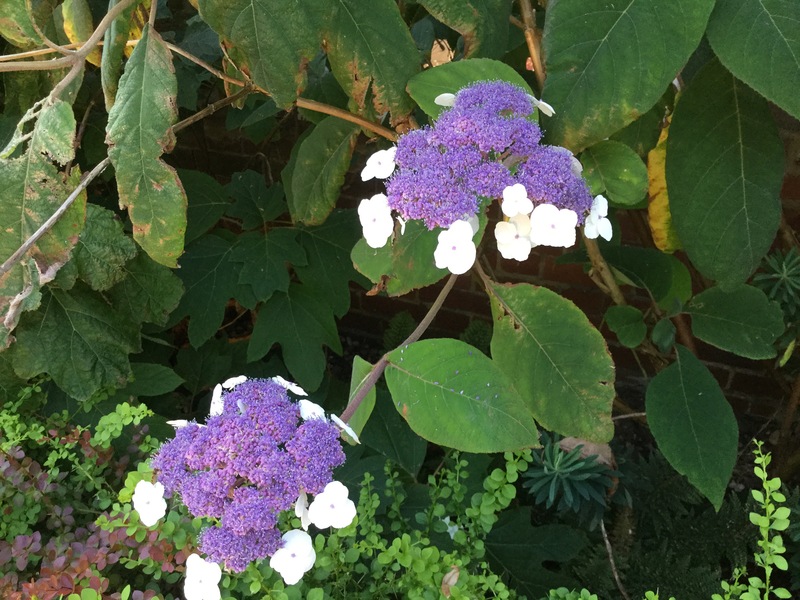 We see many gardens that have some hedging and trees and then some small perennials and shrubs, but nothing in between. 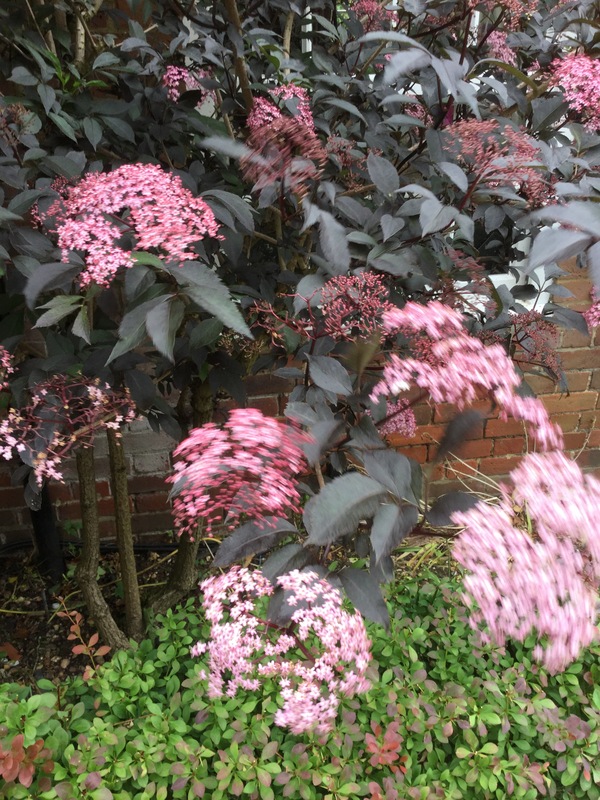 It is the bulky flowering shrubs that typically add the texture and “feel” to a garden. 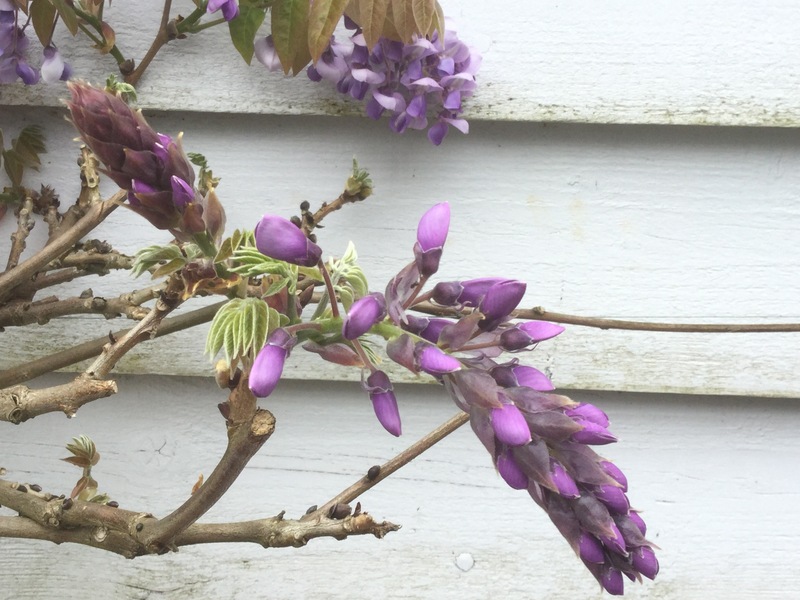 They link the large and small, create the feeling of enclosure and privacy without looming, and if chosen well, extend and develop the colour, texture and interest in the garden. 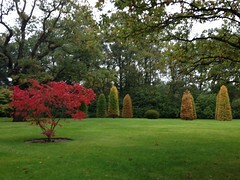 They allow you to create layering of colour, and to achieve year round interest by moving the points of interest around the garden and from foreground to background through the seasons. 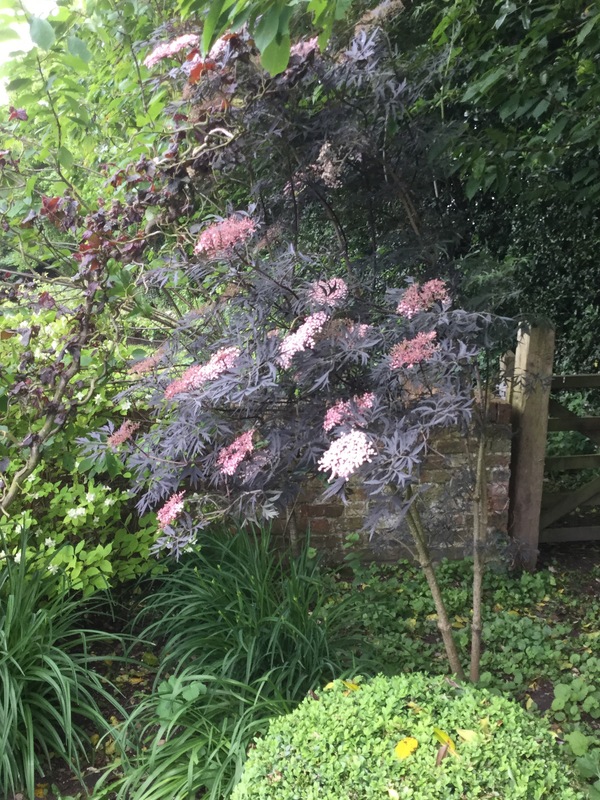 There are hundreds to choose from, and most gardens (even small ones) can fit at least a few, so I have started here with a really tough one- purple leaved Sambucus (elder). 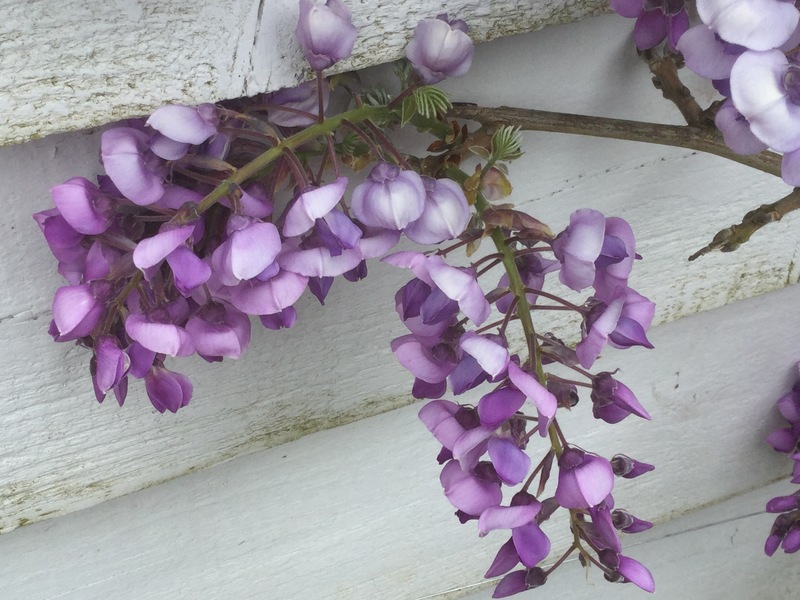 Pictured below against the porch of my house, it grows pretty thuggishly and can be cut back hard whenever suits- I usually do so in the autumn when the leaves have dropped. 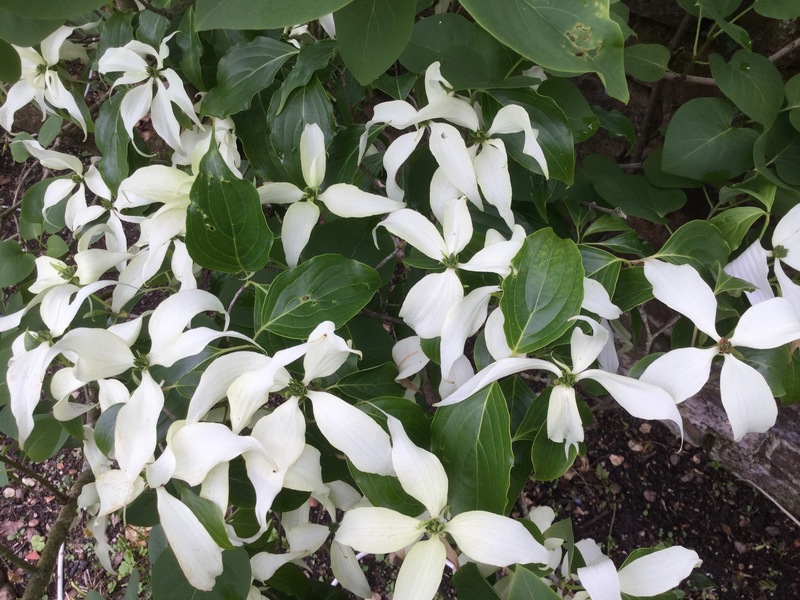 I have cut down to ground a number of times and it doesn’t seem to mind. 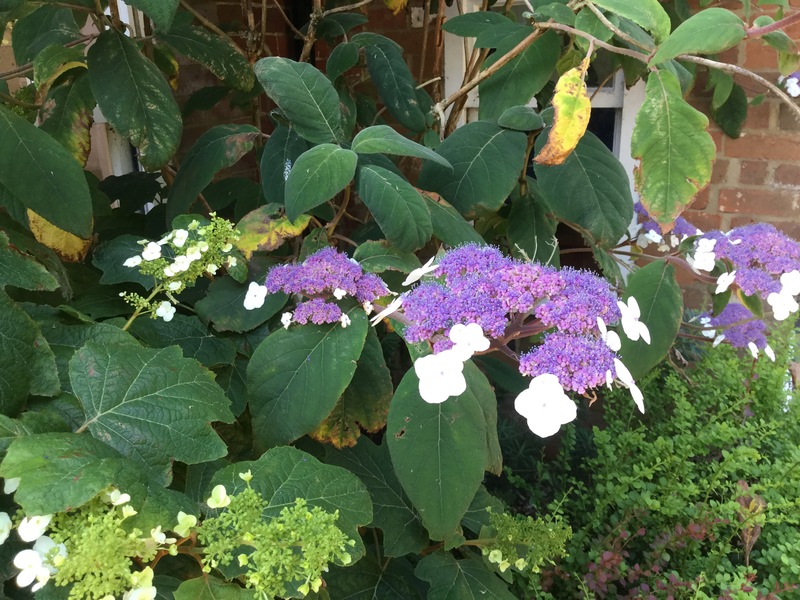 Like almost all purple leaves plants they prefer full sun, but this is a really tough plant and in this case is growing in a pretty shady west-facing courtyard without complaining. 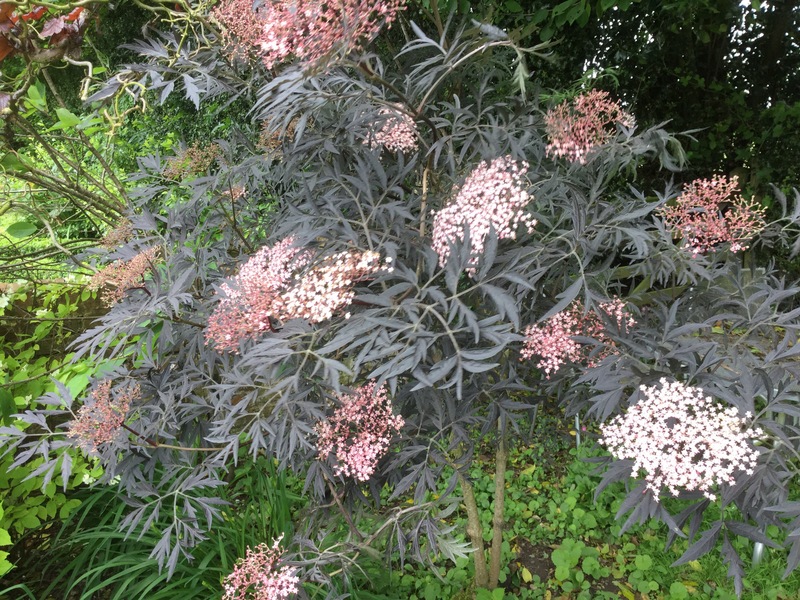 There are more elegant lacy versions- the cut leaved elder Sambucus nigra ‘black lace’ below which is a little bit more fussy about its position- getting rather leggy if not in full sun as in the image below, but nonetheless a delightful alternative to using Acers for those of us not on acid soil- although it does not have the autumn colour, you do have a good flush of pink flowers to make up for it. 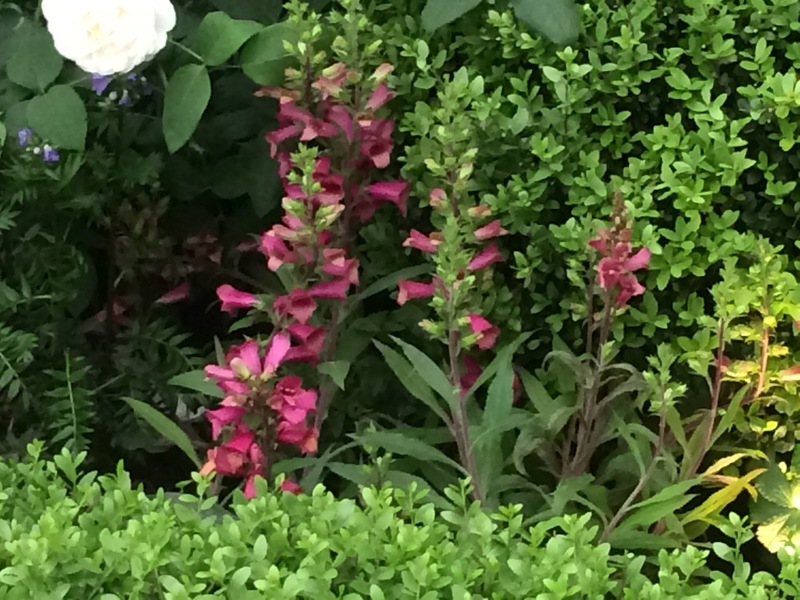 In the build up to Chelsea I have missed a week, so here are my choices from the wealth of wonderful planting that is Chelsea each year. 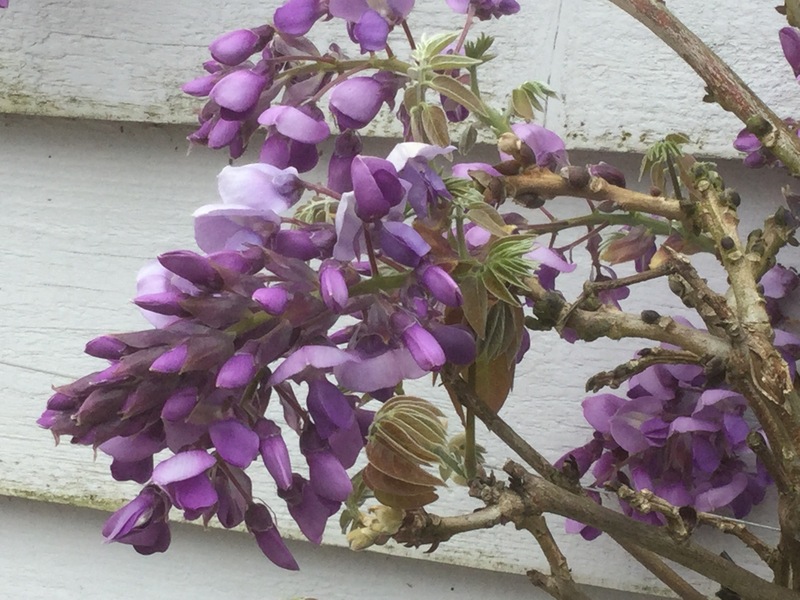 I have been going regularly since I was a child, and with a slightly different eye on things every year for the last 15 years or so- I am always amazed by the fact that there is always, always, something surprising and new. 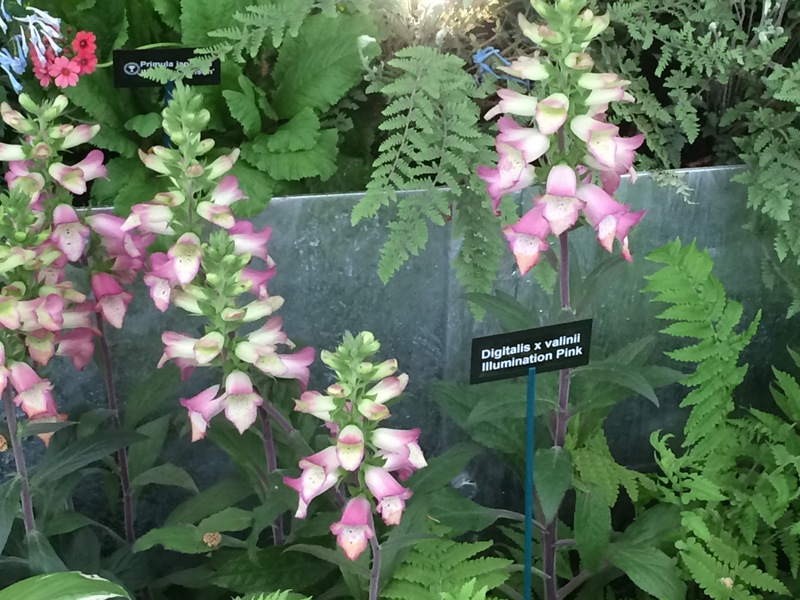 Whether this is a plant we hadn’t thought to use in the way it is shown, a new variety of an old favourite plant, or a design idea, feature, sculpture or treatment. 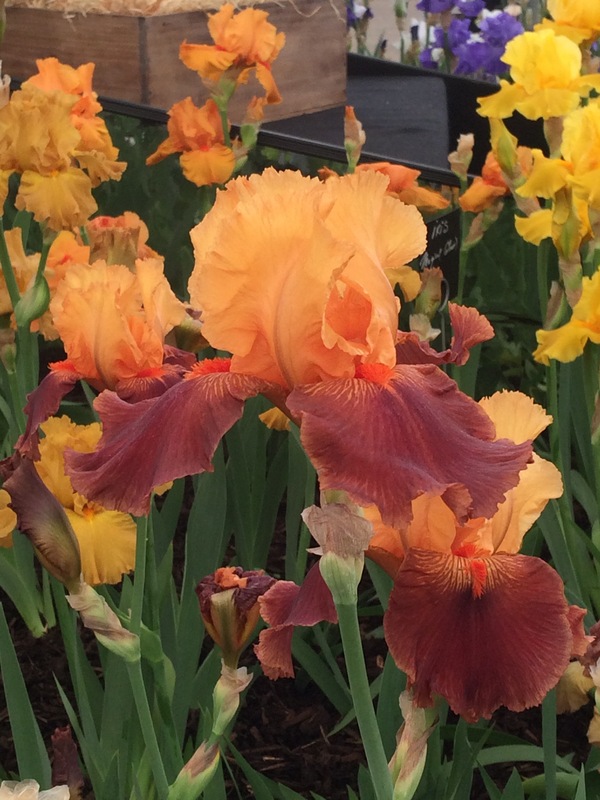 Thanks to all the exhibitors for a stunning show despite the reduced number of show gardens. 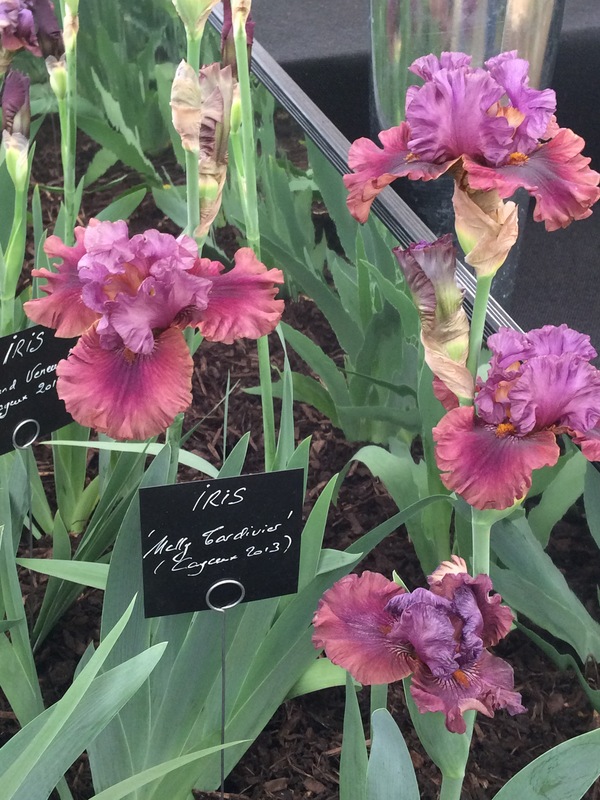 So here they are- the Iris colours were so wonderful that I could hardly decide between them. I will certainly be putting in a big order. The supplier was Cayeux- they have a fab brochure and good web site so well worth a look. 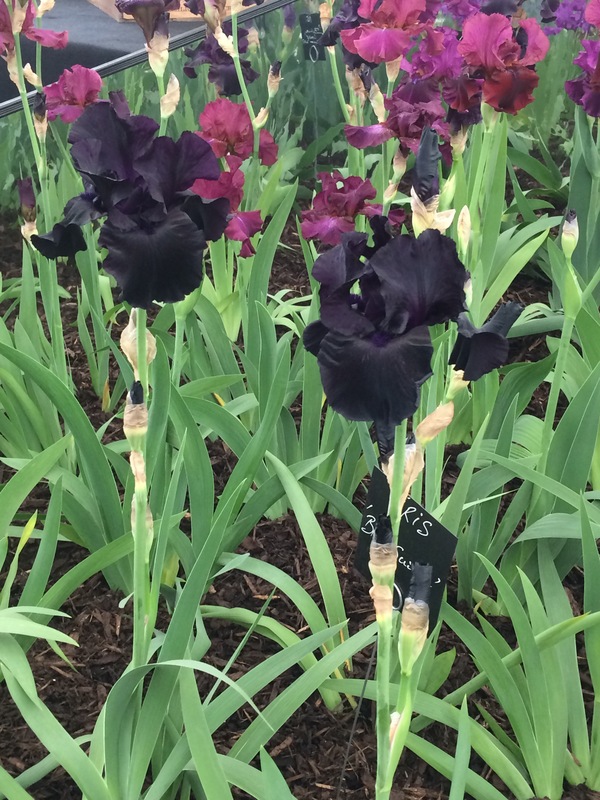 I decided on Iris ‘Nelly Tardivier’, which I will mix with Iris ‘Black Suited’ an amazing black form. 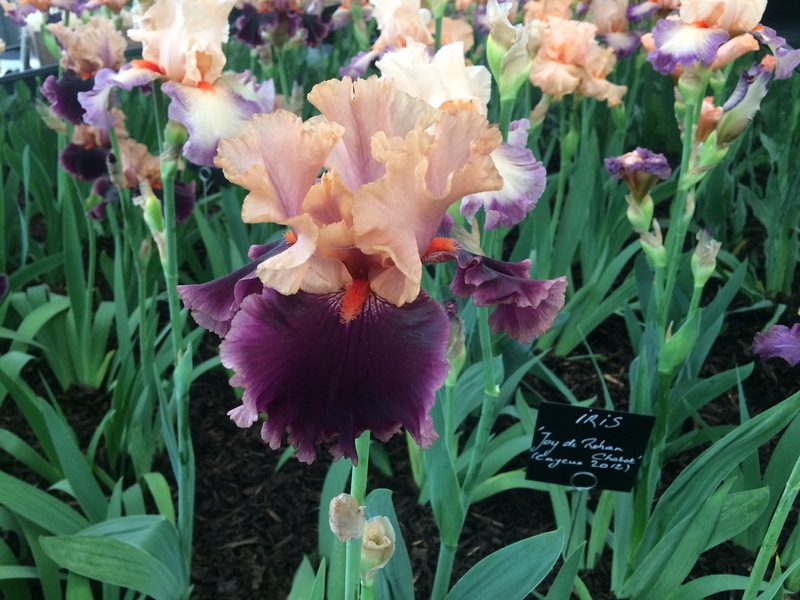 And then lighten up the display with one of the almost peachy coloured varieties, either Iris ‘Torero’….